Nigeria is regarded as the most populous black nation and the seventh most populous nation on the face of the earth and the giant of the African continent. Nigeria also has the third largest youth population in the world, after China and India, over 90 million of her population is over eighteen years of age. The country is regarded as a multicultural nation with over five hundred recognized languages and cultures, she is the true definition of beauty in diversity. The country is located in West Africa and has the largest economy in the whole of Africa, overtaking South Africa in 2014, her economy is also the twentieth largest in the world. With thirty six states and a Federal Capital Territory which is right at the center, the country is a major business hub in Africa. Blessed with several natural resources like crude oil, granite, gold, limestone, etc. the country attracts investors from all over the world. Being the most populous black nation, the country is a major market for several products that are shipped to the continent of Africa like mobile tech and automobiles. With a population of over 186 million it is expected that several of these people will be scattered all around the world trying to achieve several goals and running several businesses. The post-independence era has seen Nigeria focus a lot on oil and as such has become one of the largest exporters of oil in the world. This status has allowed for relationships with many countries like the United States of America and has made way for several Nigerian citizens to cross the border into the country. As a matter of fact, Nigeria is the largest trading partner of the United States in the whole of sub-Saharan Africa. 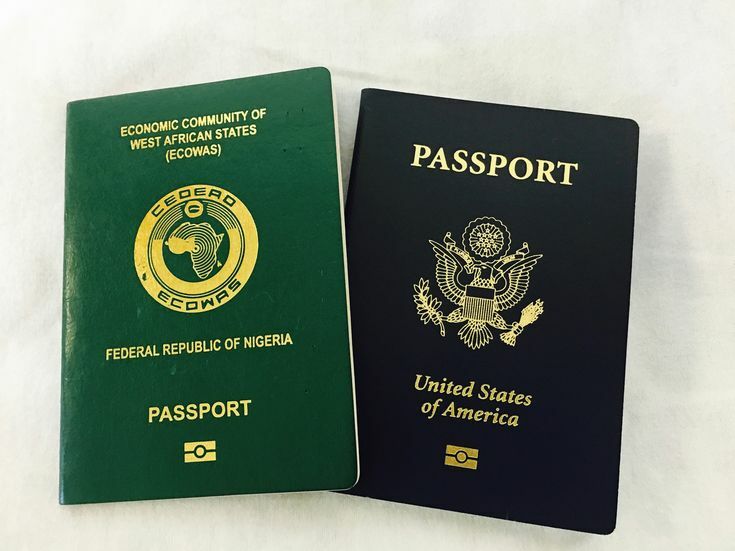 Due to the fact that many Nigerian citizens have become domicile in the United States, there is a possibility that their citizenship papers like the Nigerian passport gets expired while they are within the United States. This means that they will have to renew as quickly as possible to avoid unnecessary embarrassment. The Nigerian Government in collaboration with the government of the United States has made it easy as there is an Embassy of the Federal Republic of Nigeria located in Washington DC. The country also has consulates located in New York and Atlanta Georgia. When one renews his or her passport, a small sticker is placed on the observation page to indicate the next year of expiration. If the passport has not exceeded ten years of issuance it can be renewed over the internet, that is if the individual does not want to visit the embassy. For any individual to be eligible to renew a Nigerian passport, it must be on record that the individual was issued a passport in the first place. This individual must also be able to provide the expired passport on request at the embassy or any of the consulates. The Nigerian government decided to join the rest of the world and go digital with the passport application and renewal process. Since the 1st of July 2007, if you want to apply for a passport or renewal, you would have to fill the online form up to the payment stage and then be required to visit the Embassy, passport section to complete the application process. To be considered a worthy candidate for a passport renewal, an individual should have successfully completed the online application process by providing accurate information on the application portal. To verify this the applicant is required to produce a print out of the application form, the passport appointment document, the confirmation receipt for the passport payment, a postal order fee of thirty dollars and an acknowledgement paper of the online application. The individual must also ensure to be available at the embassy on the appointment date and on that day present the expired passport. To get more information about passport application process and other immigration issues and fees, I advise you click here. The Nigerian passport has a validity period of ten years, five years for initial validity and renewal makes it valid for the next five years. Firstly visit the immigration portal and select the passport tab. Once you do this you should select the E-passport application form and log in using either your google or yahoo accounts. It is far easier using any of these, else you might need to begin the sign up process to create an account. On logging in you will be presented a form, ensure that you fill in the proper details. Make sure the correct details are filled in as the wrong details could mean your application will be declined. Before submitting the form, make a quick print out after filling in your details. This print out will be required much later in the application process. After making the print out, you can submit the form. Once your application submission succeeds, you will be provided with a reference number and an application ID. Ensure that these are also printed out, they will also be required later in the application process. The next stage requires you to make payment for the passport application. To make this payment you will be required to have a valid credit or visa card. Just close the application form page and click on the proceed tab, this takes you to the payment page. Before making payment make sure that all the details you entered are correct as the payment cannot be retracted once it is made. When you confirm that the details are in order, you can go ahead to make your payment by clicking proceed. To make it easier, ensure that the card used in making the payment belongs to you and no one else. It takes about thirty minutes for the payment from a credit card to be acknowledged so you might need to be patient if you are making use of this means of payment. Once the payment process is completed and confirmed, visit the homepage of the website again and the application ID and the reference number provided earlier. This will help you go through the records section so you can follow up on your application. After the application payment a receipt is provided to confirm the payment. This receipt should be printed as it will be presented at the embassy when attending the passport appointment. Make sure you gather all the documents that you have been asked to print and attach them to the expired passport. This will be presented at the embassy on the day of appointment. Once you have gotten all the documents together, you may decide to send them via mail to the embassy through the address provided on the website. Regardless of this, it is still mandatory that the individual visits the embassy physically. Once again I will emphasize that the information provided during the application is correct and valid, there is always a background check done and if any of the information is found to be false or invalid, the application is declined, bringing all the individual’s effort to absolute futility. A major advantage of the process now as compared to the years of manual application is that the process is now faster and less cumbersome, you can begin the application from the comfort of your bedroom. This way you do not have stand in long queues for long hours, life is made easy. In all this remember that the Nigerian passport is only issued to Nigerian citizens, regardless of their location in the world. So if you are a Nigerian domicile in the United States and your passport is about expiring, you do not need to fret. The renewal process is quite easy now unlike years ago, just visit the Nigerian immigration website and begin your application process. You do not have to travel back to Nigeria to get this done.